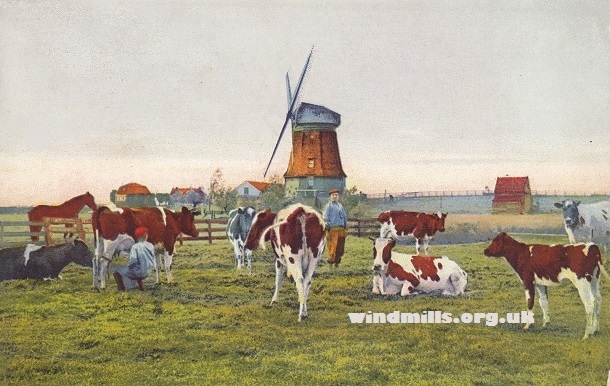 A ‘chocolate box’ type image of dairy cows, farmhands, and a Dutch Windmill somewhere in Holland. A 1930s greetings card of an idyllic Dutch smock windmill. Features cows, farmworkers, a horse, and mill. Location unknown but it looks very Dutch, was published in the Netherlands, and was dedicated to someone called Jan using the Dutch language! More than 1,200 windmills survive in the Netherlands. Many were built to pump water rather than mill cereals. This entry was posted in Old Images, Windmills and tagged Dutch Windmill on July 12, 2016 by windymiller.